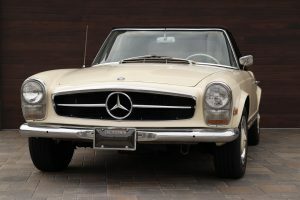 1966 Mercedes SL, Both tops, good condition, fun driver. Asking $55,000 Firm. Third owner, California car, personalized plates included. Over $10,000 in maintenance in last 500 miles. Car is garaged in Huntington Beach Ca. Previous Topic: DisneyWorld Kir Royale Anyone? We Have The Secret Ingredient!